All attached to a silver plated kilt pin. THE LUCKY SIXPENCE IS OLD. Kilt Pin size 7cm approx. BRIDE TO BE. THE TITLE OF BRIDE IS BORROWED. Inside the box lid is a handmade gift card with rhinestone detailing with the words. A Lucky Sixpence Charm. A LUCKY SIXPENCE CHARM AVAILABLE. A Genuine Sixpence. Perfect Gift for The Beautiful Bride. Give the Bride to Be a Perfect Gift. WE ALSO HAVE A LIGHTER AQUAMARINE BLUE HEART PENDANT. Lucky Sixpence Wedding Charm,kilt pin,bride,bridal,keepsake,Gift. Dates on the sixpence may vary. Very pretty when added to a brides wedding garter, bouquet, etc. Pale Blue Crystal Encrusted Horseshoe Charm. Lucky Horseshoe. Perfect Gift for The Beautiful Bride. Give the Bride to Be a Perfect Gift. Pendant Charm. YOUR CHARM WILL BE DISPATCHED IN A. Blue Crystal Encrusted. 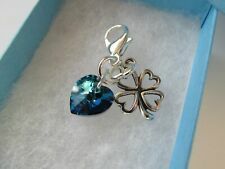 Bermuda Blue Heart & Tibetan Four Leaf Clover. Perfect Gift for The Beautiful Bride. Give the Bride to Be a Perfect Gift. Pendant Charm. YOUR CHARM WILL BE DISPATCHED IN A. 10mm Crystal Heart. COLOUR OF GIFT BOX WILL BE SELECTED AT RANDOM. BRIDE TO BE SIXPENCE. sixpence is tradition for the bride. attachable sixpence. to put inside her shoe or connect to her garter. bride to be heart charm. bride charm will vary in pictures if not requested style. This is a gorgeous clip on charm which makes the ideal gift for any bride. The charm has a lucky sixpence, a horseshoe and chimney sweep which are both lucky for the bride and a two blue hearts. The box also has an inlay as per the picture. Picture of a car with ' Just Married' on the back and a sixpence attached and the words 'for love and luck'. The reverse gives a little insight into the tradition of the sixpence (picture 3). This is a perfect gift to give to the bride for her hen do or as a little token gift which can be popped in the wedding couple's card. Completed with the traditional wedding poem, which can be personalised if required. Check out our newly launched Lucky Sixpence. A silver sixpence in the bride’s shoe is a traditional good luck wedding gesture and customarily, it is the father of the bride who places the sixpence as a symbol of him wishing her prosperity, love and happiness in her marriage. 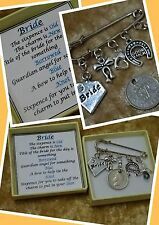 LUCKY SIXPENCE CHARM, garter, BRIDE, WEDDING, HORSESHOE, good luck, keepsake. 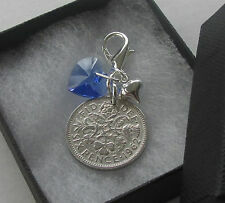 This is a gorgeous lucky sixpence charm which makes the ideal gift for a bride. The charm has the sixpence which is hand picked for quality and then polished, a heart with a blue rhinestone and a good luck horseshoe. Perfect for attaching to a garter or bracelet. comprising of a rhodium plated horse shoe charm, studded with 14 light blue crystals, attached to a silver plated lobster clasp. A Beautiful Blue Crystal Studded Horse Shoe Charm. LUCKY SIXPENCE CHARM, garter, BRIDE, WEDDING, CHIMNEY SWEEP, luck, keepsake. This is a gorgeous lucky sixpence charm which makes the ideal gift for a bride. The charm has the sixpence which is hand picked for quality and then polished, a heart with a blue rhinestone and a good luck chimney sweep. Check out our newly launched Lucky Sixpence. This silver tone charm is approx. 1 Hand stamped Sixpence. "Bride To Be" Or we can customise your Sixpence with your own message (space permitting), just leave us a message when purchasing. "Something old,something new,something borrowed,something blue,and a silver sixpence in their shoe." As the coins are hand stamped their maybe slight variation to those pictured. The sixpence will feature Queen Elizabeth II and will date between 1953 and 1967. The sixpence will have been in general circulation, so will naturally show signs of wear. The coin will be cleaned and polished ready for you to give. Wedding Lucky Charms. Mr &Mrs/ Bride and Groom/Love. Silver wedding lucky charms for the bride to hold on her special day. These come with white twine and finished with a white ribbon with Mr and Mrs printed in pale grey. These measure approx 10cm x 9cm. Thankyou. A Lucky Sixpence Charm. Perfect HANDMADE Gift for The Beautiful Bride. Give the Bride to Be a Perfect Gift. Pendant Charm. And Lucky Sixpence for Brides Shoe. Guardian Angel Bride. Bridal Lucky Charm. On Gift Card with Traditional Poem. Lucky Horseshoe. Pale Blue Crystal Encrusted Mini Horseshoe Charm. Perfect Gift for The Beautiful Bride. Give the Bride to Be a Perfect Gift. Pendant Charm. Mini Blue Crystal Encrusted. YOUR CHARM WILL BE DISPATCHED IN A. Box contains a lucky sixpence & a safety pin with charms on including a blue crystal heart. Sixpence is removable from black cushion interior so that it can be worn in the Brides shoe. Will fit perfectly inside a card or along side another gift. original condition, and remain unused and unopened.